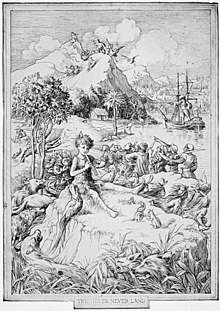 Peter Pan is a chairacter creatit bi Scots novelist an playwricht J. M. Barrie. A mischievous young boy wha can flee an never grows up, Peter Pan spends his never-endin bairnhuid havin adventurs on the island o Neverland as the leader o the Lost Boys, interactin wi fairies, pirates, mermaids, Native Americans, an occasionally ordinary bairns frae the warld ootside Neverland. This page wis last eeditit on 24 Apryle 2018, at 00:18.